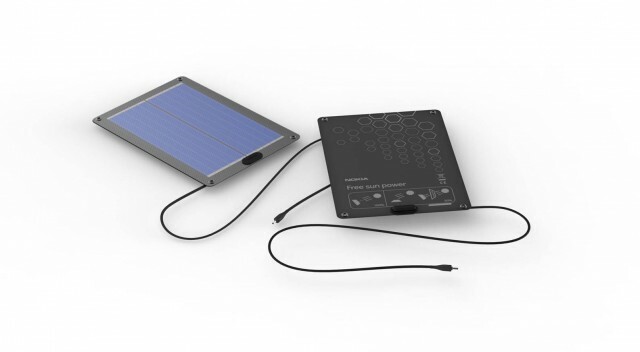 Nokia has announced the launch of a new charging accessory, the Nokia Portable Solar Charger (DC-40), as part of a pilot project to test the viability of solar charging. The DC-40, which will only be available, in limited quantities, in select African markets, aims is to provide an alternative charging method for mobile phones in areas where there is no electricity supply, or the supply is unreliable. It's easy to forget that mobile phones have become so ubiquitous that they have spread further that the power grid that the majority of people rely on to recharge a phone's battery. According to Nokia, a recent World Bank report indicated, that between 2007 and 2011, only 16% of Kenyans, and 51% of Nigerians, has regular access to electricity. Nokia has previously look at a number of other solutions to get around this issue, including the Nokia Bicycle Charger Kit, and has carried out research to explore the viability of building solar panels into phones, but this is the first time it has launched a solar charging accessory. The pilot project will collect feedback from users of the new accessory about how effective it is in day-to-day use. Following this an assessment about whether to make the accessory more widely available will be carried out. In Kenya the DC-40 will cost 1250 Kenyan shillings, which is the equivalent of around £9 ($15 / €11). The DC-40 takes the form of a thin film panel, weighing 93g, and measuring 165mm x 237mm, with a long cable and 2mm Nokia charging plug attached in one corner. Nokia say that one minute of charging will give two minutes of talk time [on a feature phone]. In ideal conditions, with direct sunlight, a 1000 mAh battery will be full after around 4 hours. "There are numerous advantages to this solution, including being able to service consumers outside of regular electricity supply, or those who need a quick charge on the go. However, perhaps the greatest benefit is the cost saving achieved by being able to harness the natural resource of the sun. Nokia prides itself on its ongoing sustainability programs to minimize power usage. This solar charger provides an extremely environmentally friendly solution that is free of CO2 emissions."